We don’t know whether the BBC has chosen its position on 9/11 and Islamic terrorism because the hierarchy sincerely believes in it or because it’s strategically pertinent, but John Humphrys set it out loud and clear in his 8:30 spot on the iconic Today programme. Tony Blair was also present. Islamic extremism is a separate phenomenon from Islam proper. We exacerbated the problem with our ‘War on Terror’. Fundamentalist Islamism is a distortion of Islam. 9/11 and similar acts of ‘terrorism’ are crimes perpetrated by a minority, who have distorted (fundamentally peaceful) Islam. These crimes have nothing to do with the peaceful religion known as Islam. We mistakenly blamed the peaceful religion, Islam, for crimes which were unrelated to true Islam. ‘Terrorists’ are straightforward criminals who have distorted the fundamentally peaceful religion of peace. We call them militants. The BBC is impartial and non-judgmental. We don’t call them militant criminals. Earlier, someone said the glorious ‘Arab Spring’ is proof that we’ve won an ideological battle. The news headlines state that ‘post-glorious Arab Spring’ Egyptians have attacked the Israeli Embassy in Cairo because of their anger at the killing of six Egyptian policemen by Israeli security forces. This apparently motivated their democratic decision to destroy the Israeli Embassy and its occupants. So, the anti Israel protests are merely because of Israel’s recent provocative, unexplained aggression? Or perhaps, since the glorious Arab Spring? The glorious Arab Spring doesn’t prove any ideological sea change whatsoever. The Arab world does not love us. 9/11 was not an isolated criminal act by distorters of a fundamentally peaceful ideology. Nor was it supported by a mere minority. It was celebrated throughout the Arab world, on September 11th 2001, and as acts against the West still are, to this day, September 2011. Tony Blair gets it, but nobody likes him, nobody listens to him, and the BBC marches on. secrets from an American government scientist! Mossad’s been trying to make him spy for Israel! Oh, wait. It was just a scam. Nowt to do with Israel after all. Just some honey-trap thingy dreamed up by the FBI. Forget I ever said anything. As you were. Just the BBC screaming more stuff about Israel. Well, they’ve got to grab your attention somehow, now, haven’t they? Both pieces talk about how this was a (misguided and wrong, in my view) retaliation for the Israeli Government’s razing of some illegal Jewish settlements in the area. The BBC reports that the Hebrew graffiti threatens further attacks, while Ikhwanweb just says the settlers left racist graffiti. It looks like it’s supposed to say something like “Mohammed go away”, but my Hebrew’s a bit rusty and this may be vernacular. There’s apparently other graffiti not shown in either report, so there isn’t enough information to draw a proper conclusion about who is more accurate. I should mention here that the Jerusalem Post reports something not mentioned by either the BBC or Ikhwanweb: the mosque was not in use, and there were no holy books inside. Unhelpful context, that. Ikhwanweb, whose sympathies are not in question and who do not claim impartiality, report Palestinian eyewitness accounts that IDF forces abetted the arson crime, while the BBC instead reports rumors of the IDF training settlers to fight Palestinians. 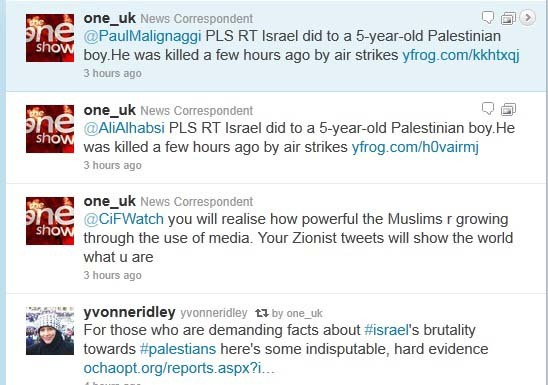 The openly anti-Israel Muslim Brotherhood reports eyewitness accounts (whether one beileves them or not, at least they’re trying), while the allegedly impartial BBC instead makes an inflammatory statement. There is some training going on, in fact, and the BBC uses this to plant the idea in the reader’s mind that the Israeli Government is actually responsible for this and future violence. Even though the training is for defensive purposes. Since the incident, more and more Palestinians have criticized the Palestinian Authority which rules the West Bank, accusing security services of not fulfilling the ”duty of protecting the mosques”. One Palestinian man Mohammed Abdurrahman condemned the West Bank security services for the inability to protect the mosques at a time when the services have effectively persecuted Palestinian resistance fighters in the West Bank. No mention of this at all by the BBC. They’re too busy stoking up anger against Israel. And there’s no obligatory moaning about the number of Jewish settlements or legal judgments about them from Ikhwanweb. One is tempted to say that the Muslim Brotherhood is more interested in accuracy and balance about the Israel/Palestinian conflict than the BBC is. Once again it seems that the Corporation’s editorial policy and innate bias cause them to demonize Israel at every opportunity, although the BBC disputes this. So John Humphrys has read the Palmer Report. Well, parts of it, he assured Mark Regev. The parts of special interest to the BBC. Not the main parts, the ones that confirm the legality of Israel’s blockade against the smuggling of arms into Gaza, but those saying Israel used excessive force when they boarded the Mavi Marmara. The fact that the BBC brought Mark Regev on at all will have irked a particular type of listener. The type who is instantly up in arms at the sound of his voice, writing letters to the BBC about disproportionate pro Israel favouritism. They’re the ones that enable the BBC to claim impartiality ‘because we get complaints from both sides’. The Palmer report concludes that the blockade is legal, as was the interception of the boat in international waters. The problem seems to arise with how this was enforced. The Israelis’ reaction to the violent reception they faced was criticised because in the end nine activists were shot at close range, some in the back, and some several times. The fact that the activists were armed and uncooperative doesn’t seem to have been taken into consideration; it certainly wasn’t by John Humphrys. I’m wondering what the difference is between being shot dead, or being shot dead several times. They must have been very dead indeed. Would it have been acceptable to the BBC if the Israelis had waited to see just how far the activists were prepared to go before retaliating? If they had allowed one or two Israelis to be beaten to death, say, before deciding that shooting back was fair and proportionate? Or should the Israelis have given in, after polite requests to lay down weapons and comply with international law? It seems that is what Mr Humphrys would have advised. He must have seen the footage of the reception that greeted the boarding party when it landed on the good ship Mavi Marmara, it was shown on Panorama after all, but given that he is aware of the violence, and who initiated it, he seems to think the Israelis shouldn’t have boarded the ship at all! “It is hard to see how they could have initiated violence had you not boarded their ship.” he says. I suppose he would think that Britain had no right to intercept armed shipments from Libya to the IRA in international waters, either. Were the activists armed and resisting arrest? Yes they were. Were the Israeli soldiers being attacked and beaten with iron bars? Yes they were. Was Israel within its rights to intercept the ship in international waters? Yes it was. Was there a “Complex combative chaotic situation and close hand-to hand combat?” as Mark Regev repeated, and John Humphrys disregarded. Yes, undoubtedly. The truth is that the BBC thinks the ship should have been allowed to break the blockade, which they still want to believe is illegal, just as they still want to believe the flotilla was carrying aid, which they still want to believe Gaza needs. They still believe that Israel is the most evil place in the world, and they still want to doubt its legitimacy, no matter what any reports or investigations come up with. UNITED IN MORE WAYS THAN ONE! Comments Off on UNITED IN MORE WAYS THAN ONE! I listened to Jeremy Bowen being interviewed from his perch on Tripoli this morning on Today (8.10am). One of the issues being covered was what united the “rebels”. Jeremy came back with the official BBC meme that it is a shared hatred of Gadaffi that united them. But hang on a moment, there is something else that unites them – as evidenced here – but left curiously unreported by the BBC. I wonder why? When even Reuters can tackle a topic the BBC runs away from you know that you are in real danger of getting a very contrived and controlled narrative. The emerging Libya’s hatred of Israel may be much greater than that of Gaddaffi but the State Broadcaster may not deign that as a problem. Last night’s Any Questions panel spoke for multiculturalism, women, and the Arab Spring. The solitary male member, if you’ll excuse the expression, was Jehangir Malik OBE, UK Director of Islamic Relief, who was roped in to opine on behalf of the Arab World. The panellists still spoke elegiacally of the Arab Spring, which, for them still heralds the dawning of a new age of enlightenment. It’s just as if they’d never heard of the disconcerting rise of Islamist groups like the Muslim Brotherhood, or listened to any of the creeping doubts that are beginning to emerge everywhere but in their own consciousness. They seem a bit like the befuddled fugitive who hasn’t discovered that the war he’s been hiding from for the last decade ended years ago. In this vein, they expressed undiluted optimism over the Arab Spring, and deep joy at the diversity and multiculturalism in the UK. The thing that was omitted from the discourse was, of course, Islam. Diversity is undoubtedly beneficial. I myself am diverse. Variety is the spice of life, and variegated skin-colour, racial origin, a multiplicity of traditions and customs are all jolly good ingredients when added to the mix in correct, proportional measure. But political correctness ignores the essential truth, which is that the benefits immigration might bring to the UK must outweigh and not overwhelm the very things that make it an attractive destination. There comes a point where those who ‘flock’ from far and wide to partake, begin to resemble tourists who, by sheer numbers, wreck the beauty and tranquility of the tourist attractions they visit, robbing them of their attractiveness in the process. Before people recognise what is happening, too many are profiting from the status quo, so don’t want to admit there’s a problem. The Islamic faith may well be beneficial in potentially volatile Islamic regimes which are kept on an even keel by people we consider tyrants and despots. They control populations by fear, as do religious leaders who stunt the imagination by persuading vulnerable people that this life is a mere preparation for the next. Refusing to get to grips with the fact that a functioning democratic society requires the population to be reasonably free from constraints that interfere with the ability to think, is a huge handicap. That’s what political correctness does to us. It won’t permit open discussion, and explains the puzzling tyranny of the P.C. edict, which proclaims ” to be good, one must be non-judgmental.” That leads to moral equivalence, which in turn might explain the frequent appearance on our screens, courtesy of the BBC, of Abdel al-Bari Atwan. Mr. Atwan has been endorsing last week’s attacks near Eilat in which Israelis were murdered. CiFWatch, the watchdog website that monitors the Guardian’s increasingly overt antisemitism, is concerned about Atwan’s frequent contributions to Comment is Free. The Guardian represents the intelligentsia, many of whom have travelled so far to the left that they’ve gone right round the back and out the other side, having picked up radical Islam along the way, like a burr on your woolly jumper. How did that happen? It’s inexplicable to many of us, and apparently to them. At least, I haven’t heard a convincing explanation so far. The BBC’s fondness for hiring Abdel al-Bari Atwan is clear. He’s never off our screens. Opining on this and that, his eyes bulging preternaturally, he’s regarded as an authority on all things Arab. Springs, Uprisings, and Resistance? Ask Abdel. His speciality is demonising Israel and fantasising about it being nuked. Is he impartial? Is he sane? Are his prejudices balanced on the air, in the short term or the long term, by opposing views? Are his views given undue respect and credibility? Why does the BBC give inflammatory, racist, antisemitic and warmongering individuals the oxygen of publicity on programmes like Dateline or Newsnight? We know the BBC is mischievous and likes a bit of a barney for the ratings. But this is serious. They might want to try and make sparks fly, but sparks have a habit of getting out of control if they’re given free rein. Any Questions? Here’s one. Does the panel think the BBC is after a conflagration? A caller has phoned in to Any Answers to self-flagellate over our colonial past, and has invented a new despot named ‘Dugaffi.” I despair. The BBC has written a report about the ruling that led to the conviction and subsequent expulsion from St. Andrews University of a young history student who put his hand down his pants and rubbed it on a Jewish student’s Israeli flag. His mate and co-culprit got off more lightly – he was merely suspended for a year. Was this just a silly prank by two drunken ‘hey Jimmies’, which received a disproportionately harsh punishment? Or was the harshness meant to deter others who might be planning to express rampantly racist sentiments, which are currently bubbling up throughout our university campuses? But there’s more to this than meets the eye. The Palestinian Solidarity bunch were performing their particular type of solidarity by providing a baying mob to boo and jeer at the verdict and at the Jewish complainant. But that’s not all. When the case first came to court in May, a cunning and exasperating delaying tactic was devised by the accused. What fun. Who knows whether this irritated the judge enough to influence his decision to take the case seriously, and to come down on the side of the young man from the rogue Zionist entity, an act that defies the prevailing atmosphere (see judge Bathurst-Norman) amongst a section of the judiciary. However there’s more ramifications to this. The young pubic hair-wielding fellow was not a “hey Jimmy” out for a drunken Sat’day night punch-up. He was a history student. A history student. Any fule kno that history can, and must be interpreted in more than one way, but I recall a lively debate on one of Melanie Phillips’s Spectator threads that was sparked off by a student at Aberystwyth University who felt he would fail his history degree if he dared to consider any other than the Palestinian narrative. It seems that Scotland is a hotbed of Israel-bashing, what with the rash of BDS campaigns that have sprouted in places like Dunbartonshire, but as Richard Millett knows only too well, where anti Zionism is concerned London is the Daddy. An aspect of this case that several people have remarked on is that pro Palestinian activists who parade their antisemitic slogans and incite antisemitic acts of violence and abuse see themselves as anti racist. The stupidity is mind boggling. Their minds have obviously been boggled, (and in my humble opinion even more sinister) not by the BNP, not by the EDL, but by our universities and academic institutions. Oh yes, and our public broadcasting corporation. First they whip it up, then they report the consequences, almost feigning innocent surprise as though it’s not their fault. A news Correspondent from BBC’s One Show has been Tweeting. This person. ‘one_uk’ describes him/herself thus: “Research Correspondent from the One Show trying to present a better image of the UK. If this photograph is genuine, and similar pictures have been known to be ‘unreliable’ in the past, it’s very sad. It’s an image of a young Palestinian victim, tragically killed by an Israeli air strike. Air strikes which the Palestinians themselves provoked by their own murderous attacks on Israeli civilians, including Israeli children aged four and six whose corpses probably won’t be appearing in any posed publicity pictures. What the hell does a BBC employee think he’s doing letting him/herself blatantly perpetuate Palestinian propaganda without a care in the world while proudly advertising his BBC credentials for all tthe world o see. The BBC’s conduct in the latest outbreak of violence has already been heavily criticised. War is a nasty business Mr. One Show Researcher, and the motto is, if you don’t like it, don’t start it. I really should have focused on the tweet to CiF Watch. If that isn’t explicit enough for your bosses at the BBC, Mr. One Show correspondent, I don’t know what is. I read in the comments that David Vance has been contacted by Heather from the BBC. Oh no, I turn my back and what happens? “Israel pounds Gaza after attacks”. Those pesky Jews once again up to their old tricks. Happily the BBC is there to record that…. The Israeli military has carried out air strikes over the Gaza Strip, targeting those it blamed for a series of deadly attacks in southern Israel. At least six people, including a senior militant, were killed in the air strikes, Palestinian sources said. earlier, Israeli officials promised a strong response after attacks on vehicles near Eilat left seven dead. Israeli officials said Gazan militants were responsible, although Gaza’s Hamas government denied involvement. Ah, those Gazan “militants”.Further down the article the BBC reports that “attacks” has “left seven Israelis dead and that a number of gunmen were killed in an ensuing firefight” Seems that wasn’t enough for those aggressive Israelis, right? Good old BBC – reliably anti-Israel to the rancid core. Today’s Telegraph reports that Steven Sugar’s widow is to take on his battle with the BBC over the Balen report. I’m not entirely sure whether this argument supports or attacks the BBC for spending £270,000 worth of licence-fee money on keeping the contents of the Balen report a secret. The film began with the birth of Israel, and didn’t shy away from including Britain’s shameful cruelty and heartlessness in rigidly enforcing a cap on immigration by Jewish refugees to Palestine, even though they were known to have been fleeing Nazi persecution. It showed the ship Exodus with a cargo of 4,000 concentration camp survivors hoping to restart their lives in Palestine, being turned turned away by the British, heedless of the fate of those on board. It described the formation of the Irgun, and explained quite fairly the cause of their resentment against the British. Fast-forward to the film’s focal point. The filmmakers had decided that Rabin and Arafat were partners for peace, both equally dovish and conciliatory, and on the brink of ending the ‘intractable conflict’ in the Middle East. Aside from a snapshot of the Grand Mufti’s notorious meeting with Hitler, Arafat’s ‘three nos’ and the intifada he engendered as he famously walked away, were conspicuously absent from the narrative, as was Islam’s inherent antisemitism. Subtlety and nuance were sacrificed for the simplicity of the fallacious message that Rabin and Yasser Arafat were heroic peaceniks, while the peoples they represented were unanimously opposed to peace. Yigal Amir, Rabin’s assassin, was portrayed as a rogue representative of the right-wing warmongering Israeli public, though a little more deranged; an extremist, motivated by a commonly held malevolent determination to scupper the peace process just so that Israel could continue sadistically oppressing the Palestinians. In other words, Israel’s own Anders Breivik, acting on behalf of the universal right-wing nutter fraternity. The myth that Arafat sincerely sought peace thrives to this day, and his modern-day counterpart Mahmoud Abbas has inherited the undeserved mantle of moderate seeker of peace. In the Telegraph Benedict Brogan explains why David Cameron is a dupe, playing dangerous games with his Security Council vote. Netanyahu’s latest concession doesn’t interest the BBC, and neither do the qassam rockets that were fired from Gaza recently . As a Harry’s Place commenter predicted, only Israel’s retaliatory strikes were worthy of a mention by the BBC. When one of the Fogel family’s murderers was convicted yesterday the author of the BBC web article felt compelled to mention Abbas’s condemnation of those behind the killings, as if to emphasise that he was a man of peace, and included, even in this incongruous context, the obligatory reminder that the world and his dog regards settlements as illegal ‘though Israel disputes this’, which smacks of the accusation that, for having the impertinence to be there, the family was ‘asking for it’. Much of the British public clings to the sentimental parody systematically projected by the left, in which Palestinians play the part of the universal victim. Images of wailing women brandishing giant keys, mutterings about bulldozed homes, shortages of food and medicine, all because of the Zionist oppressors and nothing to do with their very own ‘democratically elected’ corrupt and venal leadership. The widely-held belief that Israelis are Western interlopers transplanted onto ‘Muslim land’ by interfering outsiders who who should have minded their own business, is alive and well. Pallywood seduced the BBC, and the BBC seduced the liberal left world. The aid that Israel trucks into Gaza on a daily basis, the luxury hotels, the abundant provisions, the shopping malls and restaurants that are springing up, the virulent antisemitic passion that fuels the Islamic world, and the findings that a majority of Palestinians are opposed to the peace process and are of the opinion that Israel should not exist, are all absent from the BBC’s impartial reporting. Anyone who wishes can easily track down Arabic television programmes, translated by Memri. They can see interviews with Nonie Darwish or Wafa Sultan on Arabic T.V. stations, Imams and preachers waving their arms histrionically, screeching infantile rhetoric that would be laughable if it weren’t as incendiary and hate-filled as anything that ever emanated from Nazi Germany. If you care to look, you can watch clips from Palestinian children’s TV, and observe men in animal costumes implanting aspirations in the next generation of Palestinian children. Not, Mr. Michael Morpurgo, of peaceful coexistence with Jewish children, but of murdering Jews for Allah, and promoting the glory of martyrdom with all the gusto and advertising acumen of T.V.’s Mad Men in every sense of the phrase. In Britain today we have people expressing openly antisemitic opinions while enjoying respectability and a fully functioning public life, regularly given a platform on the BBC. We have anti Israel meetings, which purport to be pro Palestinian, where people are shouted down disgracefully; we have rabbles behaving appallingly in supermarkets and outside Israeli businesses and overt antisemitic bullying in our universities, yet the BBC, paragon of virtue and righteousness looks the other way. The BBC favours stories that show Israel in a poor light, and holds back on the rest in a decidedly disproportionate manner. Because of events in Syria, Turkey now seems willing to resume normal relations with Israel. A UN report about the 2010 flotilla, which deemed the blockade of Gaza legal, and was generally favourable to Israel, passes by the BBC unnoticed, as do the somewhat bizarre attempts by both Israel and Turkey to modify the contents of the report, pre-release. The BBC does mention another UN report, critical of Israel’s conduct during the war with Lebanon. UN special rapporteur Richard Falk blogs an antisemitic cartoon, which is ignored, yet Israel’s arrests of flytillistas at Ben Gurion airport are duly noted. Which brings me to my final point. This fascinating interview with the irreplaceable Abba Eban shows that things have changed, yet somehow stayed the same. In 1958, nine years prior to the six day war, people in the media were already putting the case for Israel’s enemies, implanting and embedding the myths that remain to the present day, and showing that it is Israel’s very existence that her enemies object to and are resisting, aided and abetted by the Carolines, Rachels, Keiras and other BBC tweeters who display their half-baked 140 character ideas with such confidence and bravado. They have probably never even heard of Abba Eban, don’t know the first thing about the history of the Middle East, and are of a mind to overlook the peculiarities of the Islamic mindset and its inherent pathological hatred for Jews. I hope these posts, which admittedly will swamp the site for a few minutes, will illustrate the ignorance, superficiality and agenda-driven half truths, which will be dished up for public consumption if ever the BBC monopoly comes to pass. It’s understandable that the BBC has chosen to wait for the grand finale before reporting any news about the forthcoming Gaza flotilla, even if the build-up has caused a stir elsewhere.So far they have had nothing to say about the elaborate preparations currently taking place in 12 European countries and various other far-flung locations. I’ve been searching the BBC news pages each day to find a reference, but the website only comes up with stories concerning the fiasco which created nine martyrs last year. This year’s extensive preparations by pro Palestinian Peace activists haven’t made the cut. Normally one might just think that’s fine and dandy, after all, ‘if it doesn’t bleed, it doesn’t lead’. But as this stunt is deliberately designed to provoke Israel, and the peaceful protesters are evidently hoping it will lead to another violent confrontation ending in bloodshed, Israel’s supporters would say background information is essential. That is, if there were to be any hope of fair reporting, if and when the anticipated drama unfolds. I find several reports about this more newsworthy than the BBC does. Apparently, the fashion for using ‘Lawfare’ as a weapon against Israel has been adopted by the Israelis and redirected at the flotillistas, with knobs on. Melanie P explains on her blog that warnings concerning potential accountability for Hamas’s future acts of terrorism are causing suppliers and maritime insurers to pull out. Various other delays and impediments to the preparations have taken yet more of the wind out of their sails. A number of the recruits on stand-by are elderly, which means that their value as human shields all but equals that of babies and toddlers. Some of us might interpret this as the cynical exploitation of expendable useful idiots, while others will see pensioners’ participation as endearingly brave and selfless. Ha’artetz has run some stories about preparatory workshops designed to whip up an atmosphere of defiance mixed with fear, creating amongst the passengers such an expectancy of violence that it is very likely to be self-fulfilling. That will provide the requisite anti Israel message for the media. There have been reports that they intend to kill IDF soldiers, but having seen that this wouldn’t fit the agenda, they are hastily backtracking on that. So the BBC has been silent, in strict, officious accordance with the genetic impartiality it’s so proud of.